Well, given the shape of the rally and yesterday's subsequent downside price overlap of some key levels, I think it's fairly safe to say the bears still have control of the market. And that they're likely to retain control at intermediate degree for the foreseeable future. I suspect the S&P 500 (SPX) will ultimately break my preliminary target of the low 1600's and head into the 1500's -- the biggest question in my mind is how we get there. I'm inclined to believe that the rally was a second wave, but it's technically possible that it could have been wave (4) of the current leg. I'll cover this in a bit more detail in a moment. Before I get into the complicated hair-splitting technicalities, let me make a couple simple statements to keep confusion from popping up among readers. I expect that near-term, we're going to make new lows. I expect that intermediate term, the trend change we were anticipating is in the early stages, and the trend is now down. 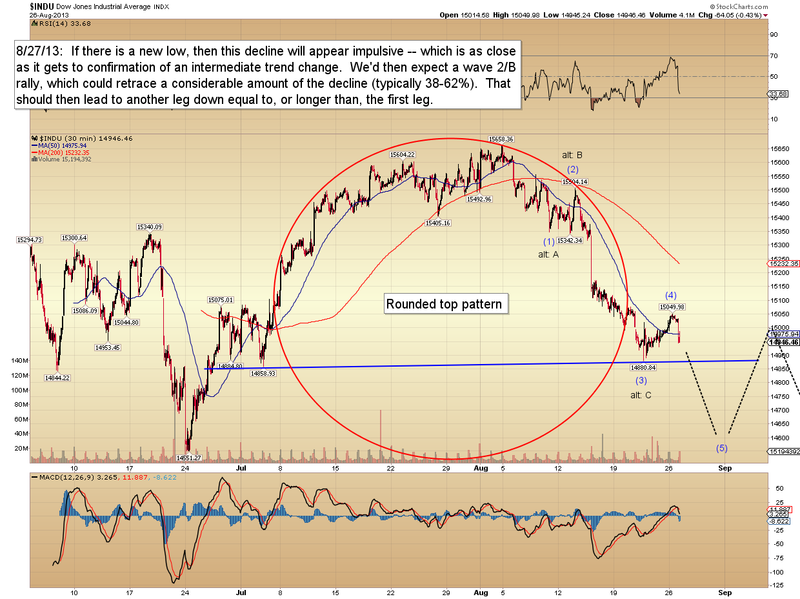 So I'm bearish, both near-term and intermediate term. The more subtle technicality is whether the rally we just experienced was wave (4) of the first leg down, or was instead the totality of the larger wave ii (much more immediately bearish). I'm giving a slight edge to the idea that it was wave ii, but I'll present the counter-argument below, using the Dow Jones Industrial Average (INDU) as an example. 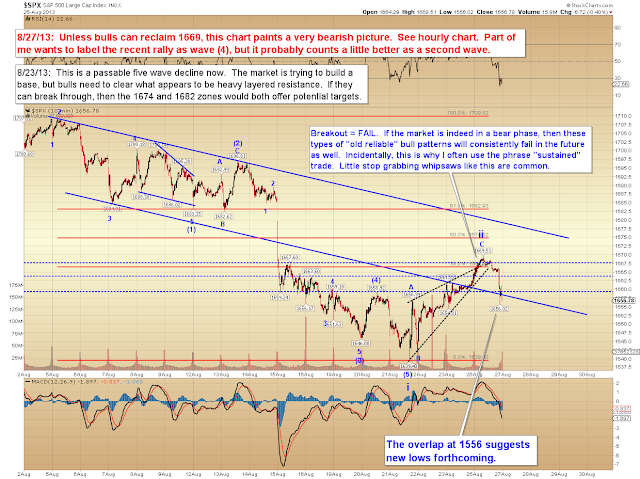 The Dow probably counts better as a fourth wave. 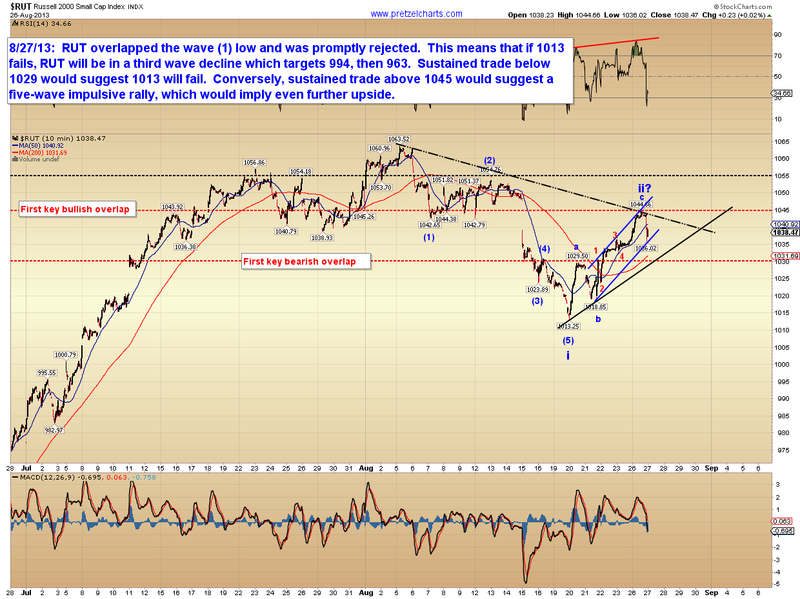 Note this picture is still quite bearish, it's simply a question of whether the bottom falls out immediately or not. The Russell 2000 (RUT -- remember around the turn of the millennium when seemingly everything was named "2000"? No relation to RUT.) 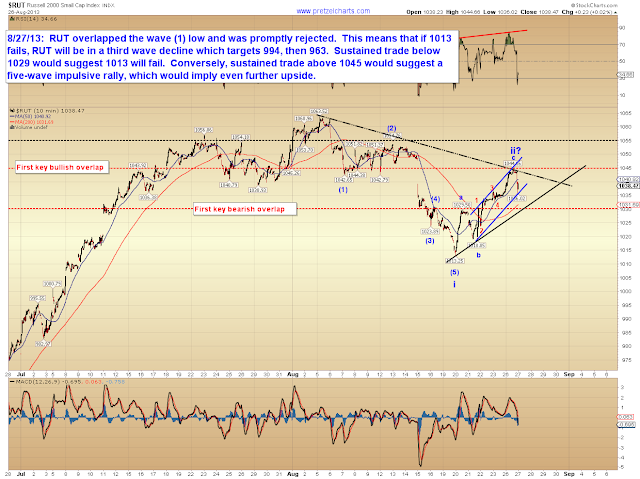 suggests that the rally was a second wave, due to the price overlap at 1042. 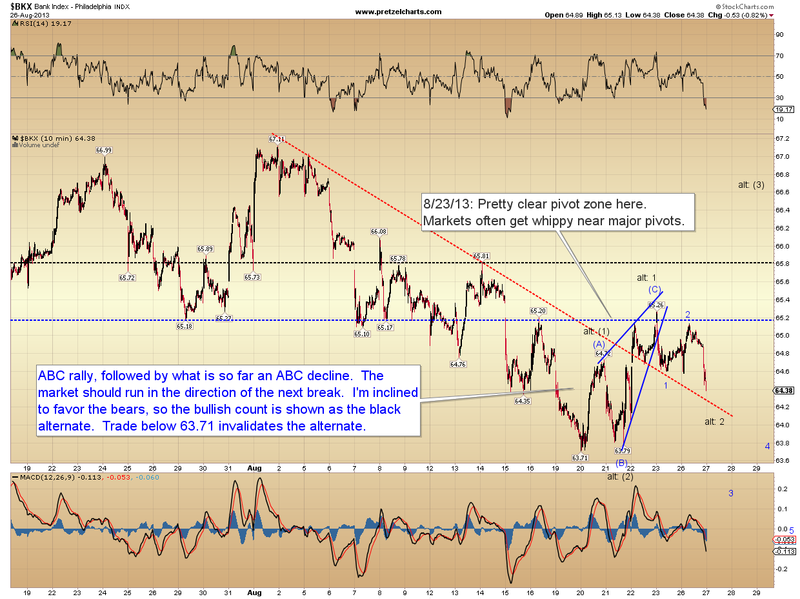 This chart paints a pretty bearish picture. 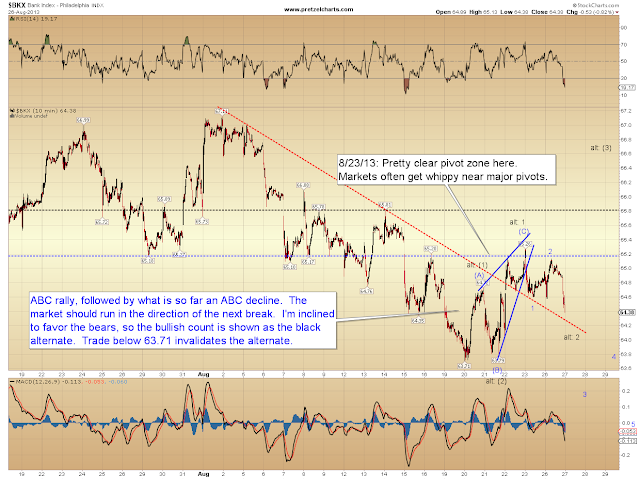 The Philadelphia Bank Index (BKX) was completely unable to clear its pivot zone. 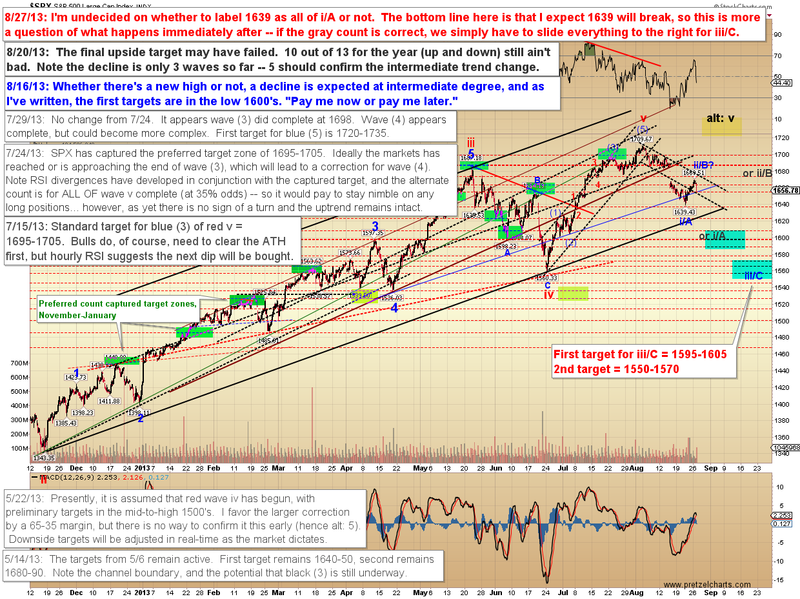 This chart notes the alternate, more bullish count. I'm heavily discounting the bull option at the moment, but a breakout over 65 would suggest I'm wrong, and that the bulls have solid potential. In conclusion, a new low would be as close as the market ever comes to "confirming" anything, and should confirm a trend change at intermediate degree. 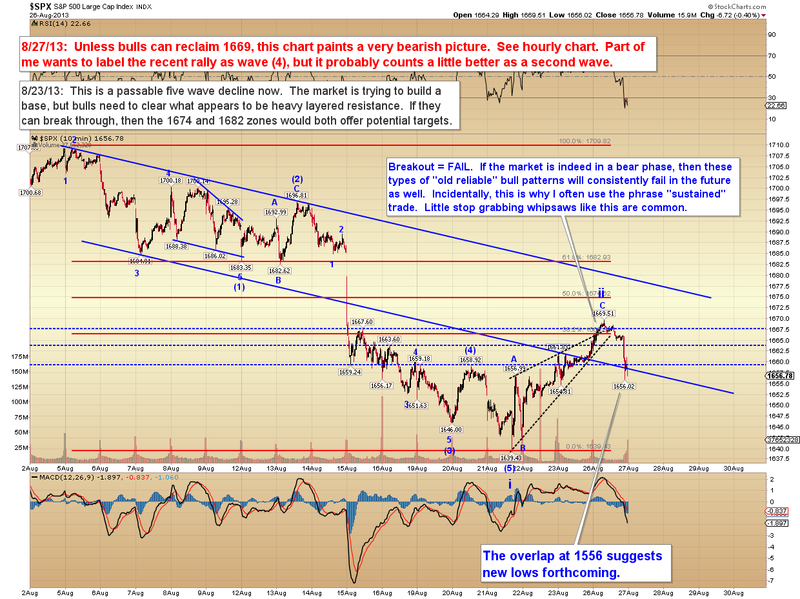 I expect we'll make that new low, and I therefore expect we are indeed in a bearish trend at intermediate degree. As I see it, the best hope for bulls at the moment is for the next low to be the fifth wave of this first leg down, and thus give them a good bounce to sell in to. 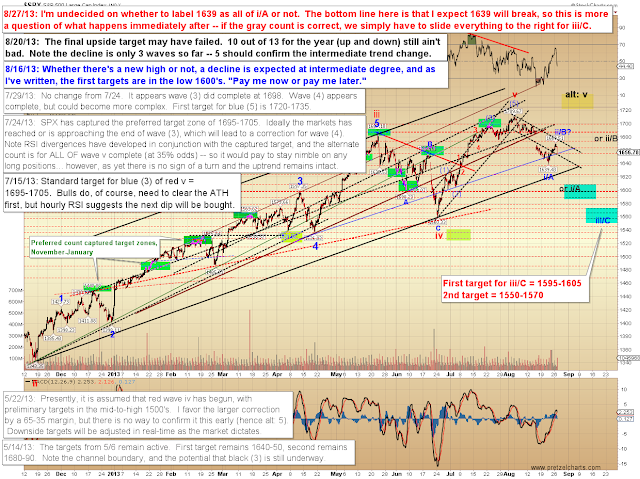 But either way, I believe SPX will see the 1500's (and possibly much, much lower) before it sees the 1700's again. Trade safe. Reprinted by permission; Copyright 2013 Minyanville Media, Inc.